now, I am adding sour cream chocolate cake to my list of other than using 'butter and sugar' in a cake. My first time baking and featuring cupcakes on my space... and it will not be my last ;P.
Why cupcakes, when there is no longer the craze for cupcakes? Well... if you have been following my blog, you'd notice that I don't really follow trends. I move like a sloth when it comes to trending food. It was hub's birthday last month, the birthday boy has to bring a cake to share with his officemates for their Fridays coffee break. When I was told to bake a cake for 30 pax! I had my panic moments!!! Who wouldn't! If I were to bake a puny cake (my standard 8 inch cake), everyone will get a smallest slice ever, or just crumbs. My go to cake.... Nigella's Old fashioned Chocolate Cake featured in Feast magazine. and I love the way she described the cake in her introduction paragraph. I could almost hear her silky, sultry voice as I was reading the blurb :D.
If I were to frost the whole cake for hub's office mate, I would have many sleepless nights, my frosting is still wishy washy. Sour Cream Chocolate Cupcakes, based on Nigella's Lawson famous "Old Fashioned" Chocolate Cake, featured in Feast magazine. Sieve flour, sugar, baking powder, bicarbonate soda and cocoa powder into a mixing bowl. Add butter and sour cream into the bowl. Beat on low speed, until well mixed. Add eggs and vanilla paste. Mix on high speed, for 2 minutes. Place batter in piping bag. Pipe into cupcake casing (about 35g each). Melt butter and chocolate using the double boiling method. Sieve icing sugar into another mixing bowl. Add golden syrup to the cooled chocolate mixture. Add sour cream, vanilla and the sieved icing sugar into the chocolate mixture. They look lovely! 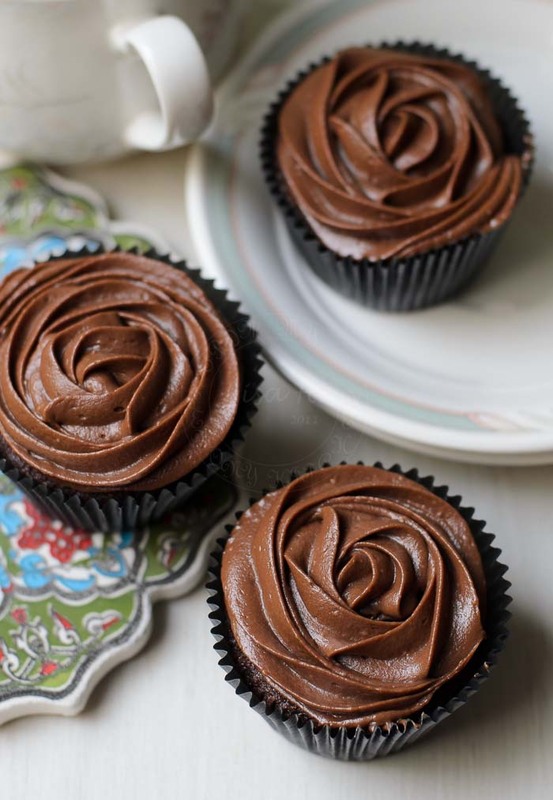 I love the use of sour cream in these chocolate cupcakes.